On April 19th, the City of Vancouver officially legalized short term rentals and Airbnb for Vancouver residents. Home owners and renters will now be able to get a license to operate an Airbnb listing, but the qualifications dictate that not everybody will qualify. 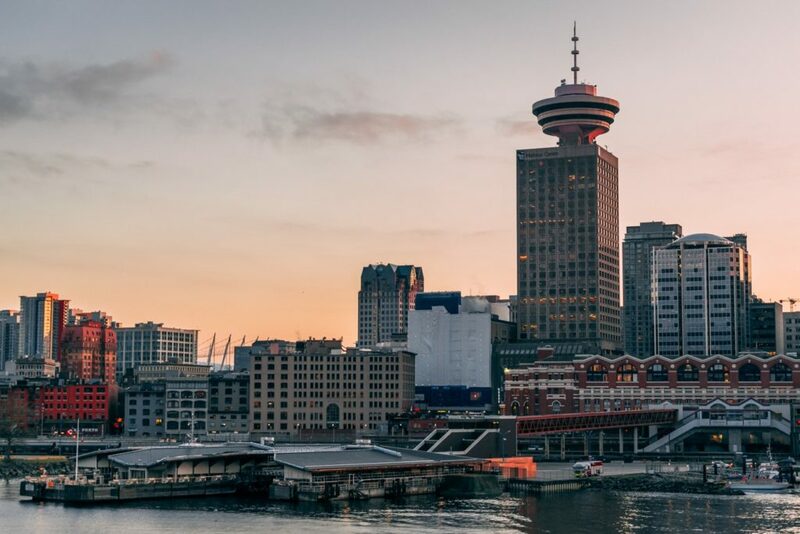 HeartHomes only works with owners who can operate legally in Vancouver, so we’ve got the scoop on who qualifies for a license and how to get one. Your building strata approves of short term rentals in your building (check your Strata bylaws). For more detail on this, you can do this quiz to be sure that you qualify. If you fulfill the above requirements, you will qualify for a licence and can apply for a license online. However, if one of the above is missing – for instance, you own a condo in a strata that prohibits short term rentals or sublets less than 60 days – you cannot procure a license. The city is giving residents just over 4 months to get licenses before cracking down on unlicensed rentals. Getting a license will cost each resident $49 per year plus $54 for the initial application. When you are ready, go to here to apply for a license and wait for it to arrive. Once you have your license, you will need to input your license number in to any short term rental listings you have on all sites. This means you’ll need to put the license number on your listings on Airbnb, VRBO, Homeaway, and any others you list on. We recommend only using Airbnb for a number of security reasons. We will write about that soon. 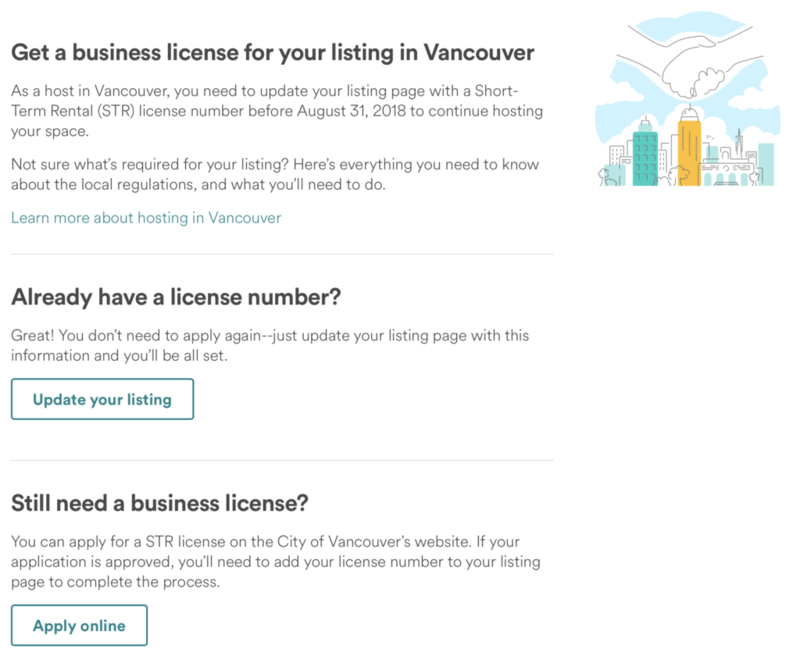 Airbnb will provide a field in the listing for you to input your license number, and the city of Vancouver will be able to see this license number on your listing. Airbnb is cooperating with the city to share data, to ensure compliance. The city of Vancouver says that it will fine non-compliant residents a hefty fee, but we don’t anticipate those fines will occur before the end of summer. The city wants to give people plenty of time to procure their licenses. After August 31st, residents can expect fines if they refuse to comply and continue to list their properties on STR sites. Furthermore, Airbnb will delete and remove listings that do not have licenses at the end of August. They have formed an agreement to share data with the city and cooperate with the laws by deleting unlicensed listings. When you input your license number in to Airbnb, you are also asked to consent to Airbnb disclosing your license number, full name, email address, and listing address to the city. Airbnb will share this info with the city to cross check licenses with the city’s database. Conceivably, this is done to prevent people from using multiple licenses or listing more than one property on Airbnb. You can revoke consent to share the info with the city at any time, but of course once it is shared, the city will always have access to that particular data. In order to be exempt, you’ll be asked to prove #1 or #2 with an address and contact info. 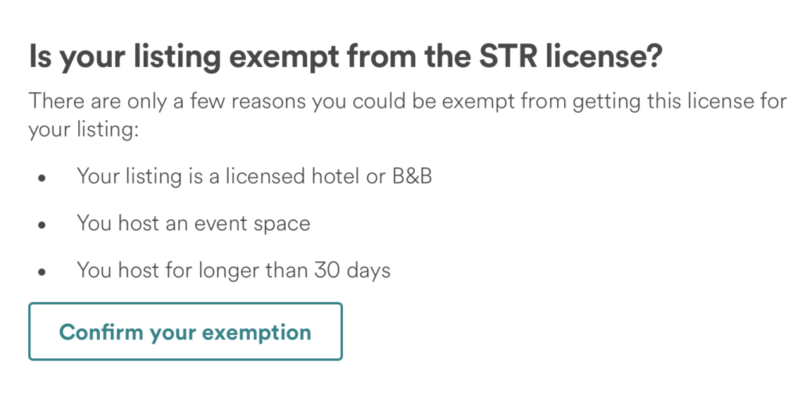 If you want to list your space for 30+ days, it is not clear what you must do with your Airbnb listing. It is assumed that you must set your nightly minimum to 30 days or more, and possibly not have any confirmed reservation son your account that are less than 30 days. Exemptions do exist, but they are sparse. If it isn’t your principal residence and you are the owner – you can’t short term rent the property. You can place a 30+ day tenant. You must have it tenanted for at least 6 months, or face paying the empty homes tax. If it isn’t your principal residence, and you are a tenant – you can’t short term rent it. If you’re renting more than 1 property, you can only short term rent the one you spend 6 months or more in. You can sublet the property with permission of your landlord. If you don’t live in a legal dwelling that has passed inspection – you cannot short term rent. The safety standards for short term rental units are high, just like the safety regulations for hotels. Hosting guests raises the stakes on safety, so the city is keeping the standard high. If your landlord doesn’t approve – you cannot get a license. The owner of a property has the right to refuse short term rentals. If your strata does not approve – you cannot get a license. Your best recourse is to make your desires known and participate in votes relating to short term rentals. Strata councils in Vancouver won’t vote in favour of short term rentals unless their residents choose to make it so. What is going to happen to Airbnb in Vancouver? It is likely that the number of Airbnb listings will shrink over the next 4 months, until non-compliant listings are deleted on Aug 31. For better or worse, there will be a smaller amount of Airbnb listings on the market. This means more long term renters in Vancouver homes. Residents who have the ability to list their place will benefit from higher demand, and a smaller supply of short term rentals on the market. Over the next few years, strata councils will authorize short term rentals because of the numerous benefits, including raising the property value of each unit in the building as it has in other major cities in North America. Simply put, owners who can Airbnb their home have a more valuable asset than those that cannot. Over time, the Airbnb listing supply will rise back up, benefitting residents and the tourism industry in Vancouver and beyond. These bylaws only apply to Vancouver proper, not Burnaby or Richmond. In Whistler, short term rentals have been legal in certain zones for years. It is only a matter of time before all municipalities have bylaws governing short term rentals. Heart Homes helps legal owners and residents manage their Airbnb listings in Whistler, Vancouver, and Tofino. We help owners get licenses, STR insurance, and manage the many day-to-day operations of operating an Airbnb listing. We make it secure and easy to host guests while you are out of town. Contact us if you want help managing your short term rental process. Any step along the way, we’re here to help.